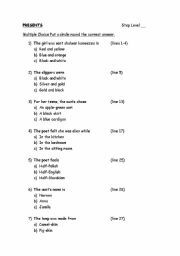 Harry Potter: Link the sentences with connectives. 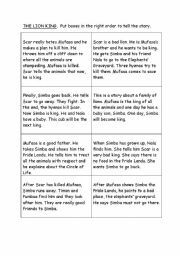 This worksheet is based on ´Harry Potter and the Philosopher´s Stone´. A series of sentences are presented which must then be joined up with connectives. 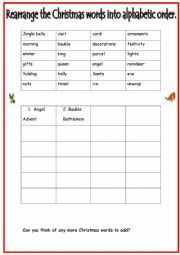 The sentences can then be used for discussion, cloze exercises or a memory game. There are two sheets, each with a picture of harry with friends. There are true/false,gap fill, questions and ideas for extension. 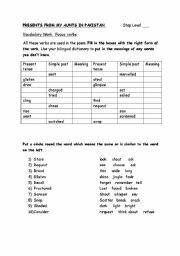 Not linked to any particular HP film - good as starter or to reinforce present tense/ description / prepositions. 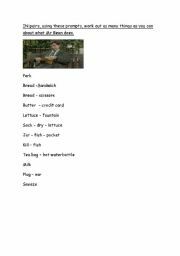 This worksheet is to accompany the short Mr Bean clip (on youtube) Mr Bean goes to the park and makes a sandwich. can easily be converted to past simple focus. 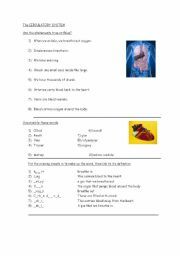 Differentiated sheet for helping pupils who are learning about circulation in science. 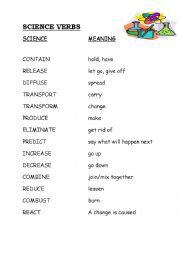 I have these words on my wall as a poster and occasionally make sentences using the ´Science´ verb and ask students to choose the correect every day alternative. There are two sheets, one a sequencing activity at intermediate level, the other at elementary level. I used these with stills from the film - easy to download. I also blanked out the verbs for the pupils to replace. How to cook soft boiled egg and soldiers. 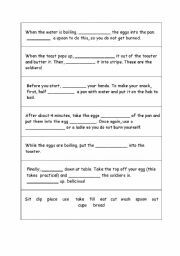 I used this sheet with a practical activity, cooking that typical English tea time treat - soft boiled egg and soldiers. First, the students put in the missing words and then put the instructions in the right order.